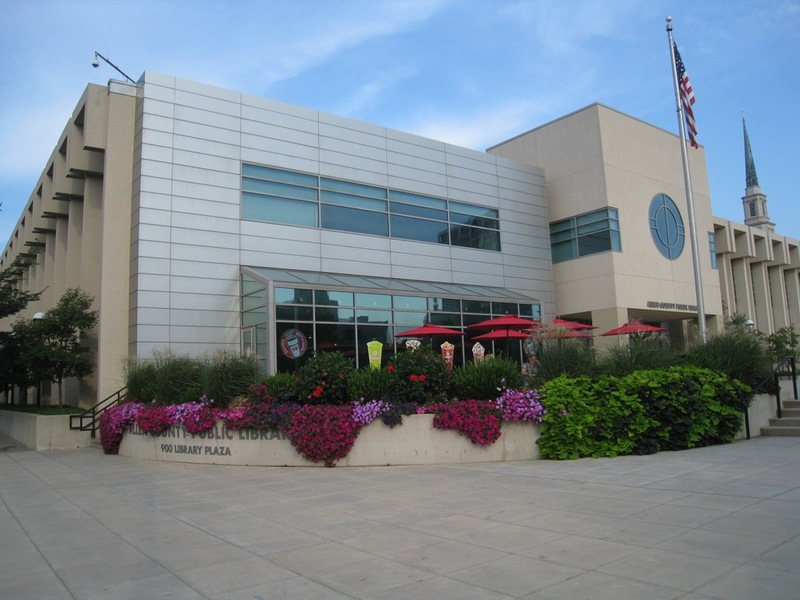 Since I am attending the Federation of Genealogy Societies Societies conference in Ft. Wayne, Indiana this week, I had the opportunity to spend several days at the large Genealogy Center of the Allen County Public Library. The library itself is huge, and the Genealogy Center is massive. 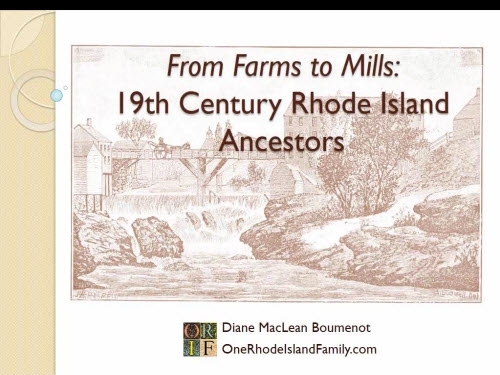 It holds many, many books, and encourages genealogists to submit their own works for reproduction. In this manner they have amassed numerous works not available elsewhere. For those not visiting, some of their collection has been digitized and made available online. I usually access them at this FamilySearch site. The library has a significant microfilm collection (although somewhat midwestern oriented) and databases which can be used on site. 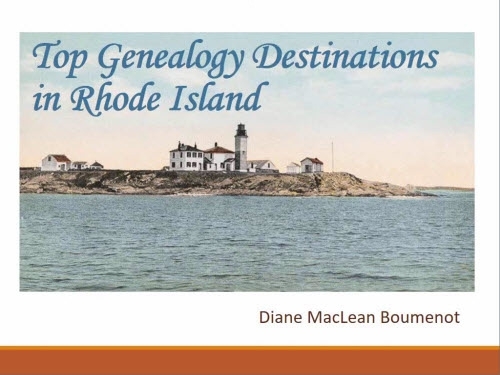 You can learn more about that through genealogist Harold Henderson’s guide to navigating the library and the ACPL Genealogy Center web pages. I got to meet Harold at the conference. At the library, there were many helpful staff and volunteers. 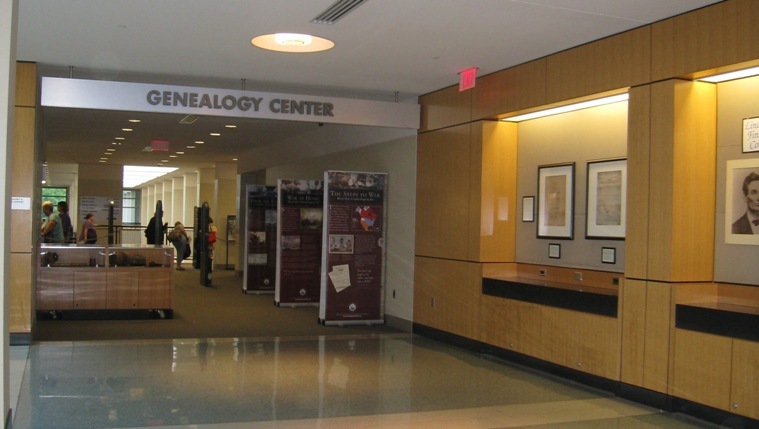 The Genealogy Center was a very busy place. Otherwise, I took pictures of pages from books (as well as the title pages) for use later, at home. To make sure I wasn’t missing anything I used a list I had compiled from the card catalog before arriving and printed “State and Subject Snapshots” such as the Rhode Island Guide, Connecticut Guide, and Military Guide which are good to walk around with since the call numbers are printed right on the sheets. 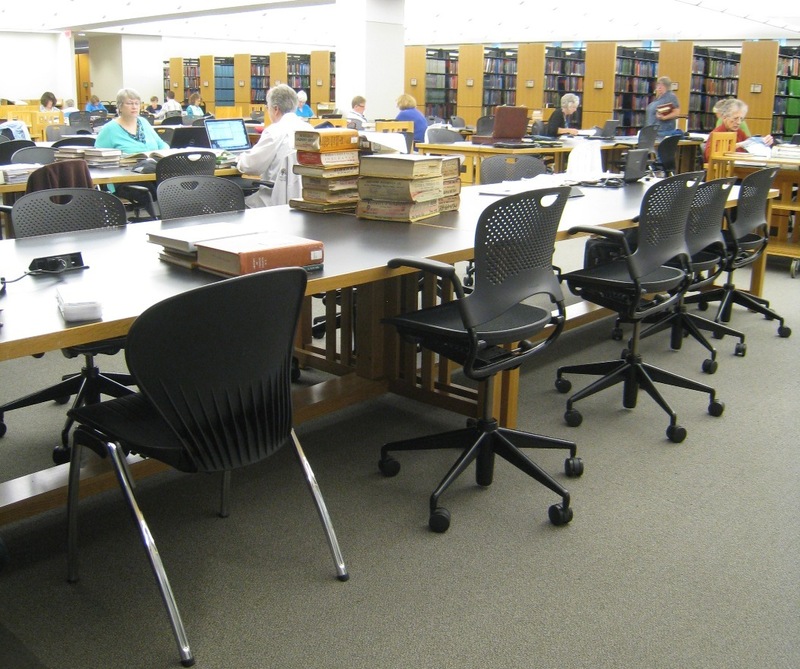 There are so many periodicals here that the library offers a unique opportunity to find articles from obscure local history and genealogy periodicals and newletters, as well as the major journals. Access is through the Periodical Resource Index (PERSI) available through Heritage Quest, but created right there at the ACPL. Heritage Quest is available at many public libraries. The difference at the ACPL is that each article should be available right at the library. I only looked at the articles I needed to while here; the ones which I can access from home will wait. None of the articles were that revealing, in my case, but perusing those obscure journals reminded me of the good work done locally on transcribing records and telling stories; I need to be sure I am accessing such content regularly. There is talk of PERSI moving to a new platform in the near future which will add access to the journal articles themselves online. That would be extremely valuable. 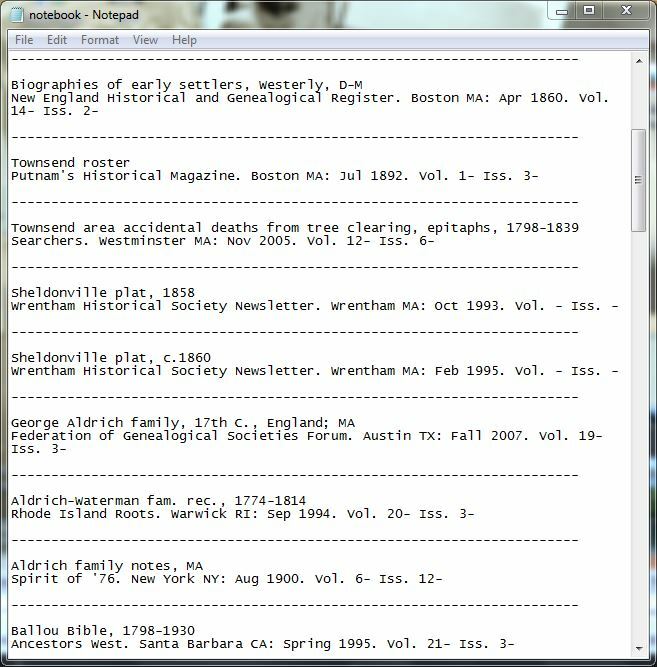 I also found some more serious articles in standard genealogy journals which may not directly address my ancestors but will give many clues in the footnotes for further research. While at the library, I photographed many sections of books for further evaluation at home. But there was one problem I actually made progress on. An abstract of James’ request to the British government for compensation after the war, with some details of his Loyalists activities, and details of the property he lost. I may be able to obtain the actual record. an abstract of a 1765 Fells Point, Baltimore probate record giving James guardianship of the minor daughter of a friend as well as several costly items such as a mirror, silver spoons, and a gilt picture (of “Our Saviour on the Cross”). This led me to believe James may have been Catholic or Anglican. a 1788 probate abstract for an Anderson in Fells Point who leaves his property to his wife and daughter but urges her to share some property if possible with “my family in Pennsylvania”. If this person could be James’ brother, the Pennsylvania reference could be a clue to their origin. And to balance things off a bit, I also found a note about my 6x great grandfather, Richard Ballou, being among the Cumberland (RI) Rangers in 1776. He would be my first Rhode Island Revolutionary War soldier, if I can ever prove that. 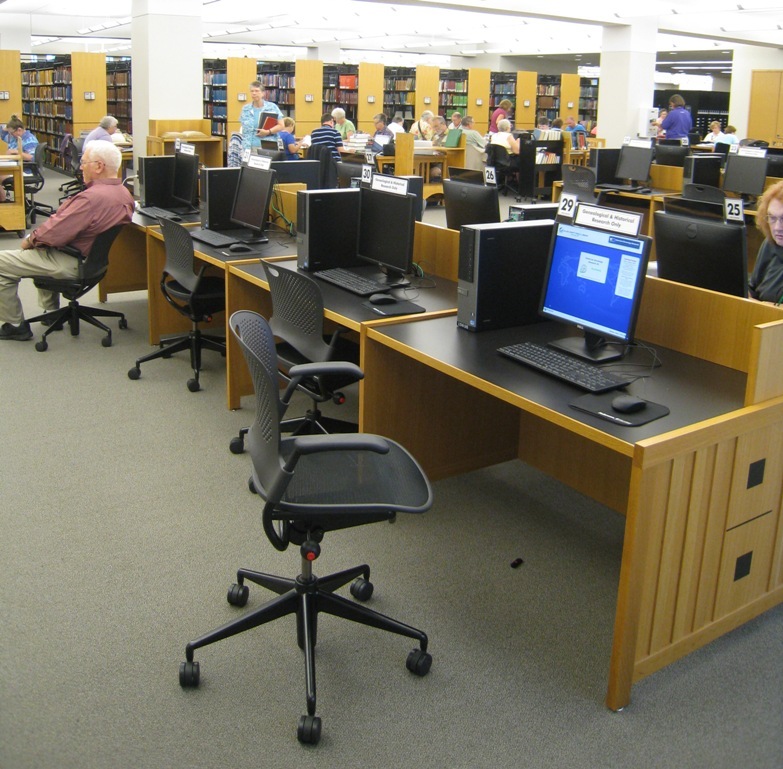 I still would say that access to an enormous amount of records – such as those on microfilm at the Family History Library in Salt Lake City – is an ideal research environment. I probably looked at hundreds of books during my week at the Allen County Public Library. But books may or may not show helpful sources, and I think many “surname” books rely too heavily on easily accessible records – they compile low-hanging fruit, in other words – on a wide swath of a family and seem to reproduce the same assumptions and mistakes as earlier books. When books contain abstracts, maps, records or local information, they come closer to meeting research needs. And there were plenty of those in the Genealogy Center. In my next post, some thoughts about the conference itself. All this work was made possible by the Dunkin Donuts located IN THE LIBRARY near the front entrance. Sarah has always been facinated with her great great grandpa John Mike and both she and I would love to know more about him and what happened to him, that is why I am reblogging this wonderful article. Maybe one day we will get to come here. Wonderful write-up! Maybe I’ll stop there when I do my return road trip in a few weeks. 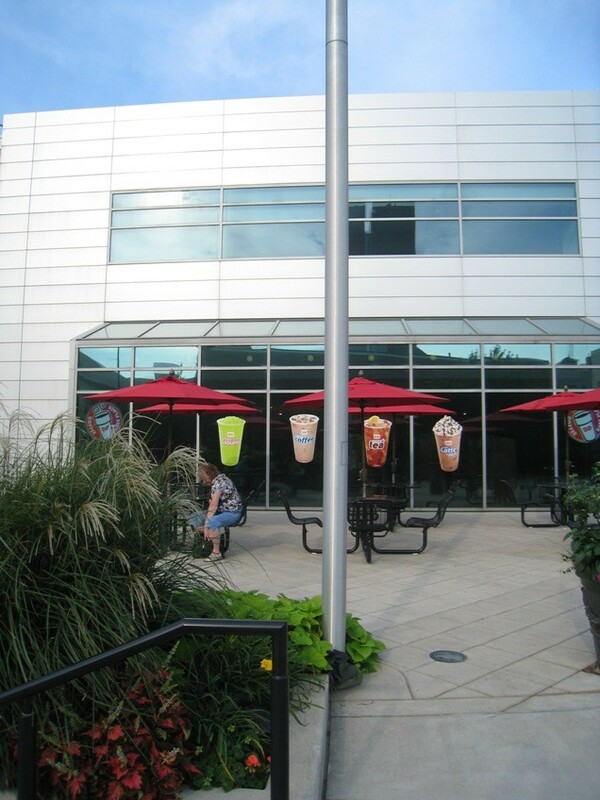 I have always wanted to visit the ACPL, and now I really want to go. Thanks for being so clear about what you found. And for encouraging the use of a digital camera. I can’t believe I waited until this year to photograph pages for later review. It saves me huge amounts of time. Ann, I totally agree, it is easier to stay at the table and photograph than to line up at the copiers. It really works for me. Thanks for reading! As always, I enjoyed reading your post. 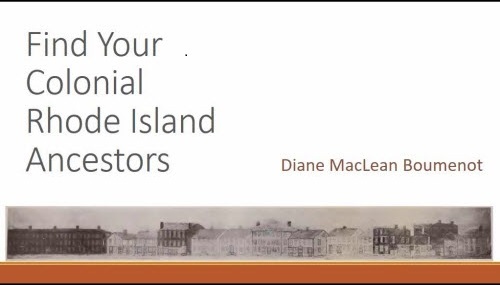 Thanks for sharing Diane! So many of us had great finds in such a short period of time. (And my book is digitized and available on ACPL website). Kathleen, sorry I didn’t get to say hello, I heard you were there. Can you tell me what book is online there? thanks!! Great post, Diane – you show how necessary to be well-prepared ahead of hitting a large library like the ACPL. Camera shots, notes, PERSI details… I’m clearer and clearer about what I need to do before I ever hit the ACPL or other such repositories! Thank you so much for your wonderful posts – I not only enjoy reading them, I learn so much each time. Cheers. Thanks Celia!! I really enjoyed my visit there.